A rich and delicious, though light, dessert - perfect for summer. 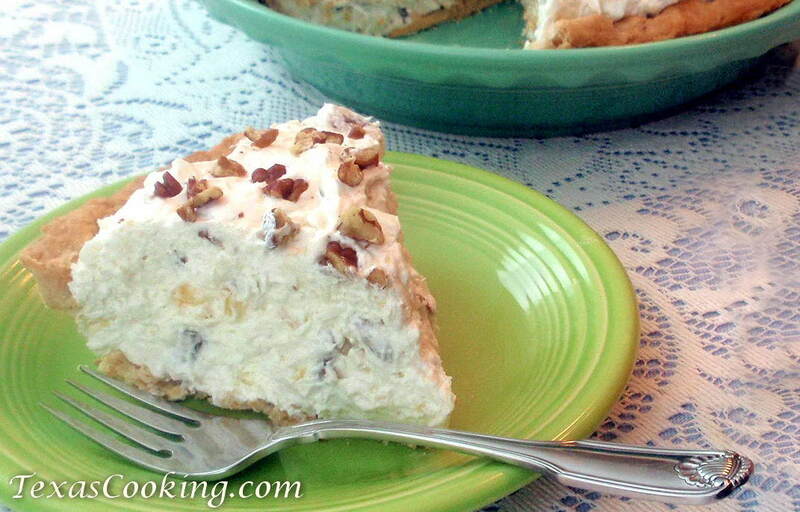 I got my first taste of Millionaire Pie at a Wyatt's Cafeteria in Fort Worth back in the fifties. It was an instant hit with all the after-church-on-Sunday crowd, and the recipe quickly made the rounds. For those of you with pie-baking phobia and, apparently, there are quite a few of you, Millionaire Pie is remarkably simple to make. It can be made with real whipping cream, but this recipe calls for frozen whipped topping, such as Cool Whip, instead. Ordinarily, I prefer to cook with real dairy products, but I think this pie has a better, more uniform texture, lasts a little longer and tastes just as good with the non-dairy substitute. And, of course, it results in fewer calories and fat, but we're really not going for a low-cal dessert here, considering the other ingredients. Unless you want your pie to have a pastry crust, you won't even have to turn on your oven. Links to several no-bake crusts are provided below. This is a rich and delicious, though light, dessert -- perfect for summer, but I guarantee you it will be appreciated any time. It's up to you but, whatever you do, I think you'll enjoy this pie in every sense of the word. Cream together the softened cream cheese and the sugar with an electric mixer, letting the mixer run for 3 or 4 minutes on high speed. Stir into the cream cheese mixture the crushed pineapple, coconut and pecans, and mix well. Carefully fold in half of the whipped topping until filling is blended well. Reserve remaining half for top (see below). Pile the filling into a baked pie shell, and chill for several hours.